Studio shots, no. 94: Haywood and Mollie Vines Baker. Haywood W. Baker and Mollie Vines Baker, perhaps taken near Stantonsburg in the 1910s. Though this is not, strictly speaking, a studio portrait, the formal posing and prop seating of this image strongly suggest that a professional photographer was behind the camera. On 5 November 1898, Haywood Baker, 20, son of Richard and Almira Baker, married Ora Harper, 19, daughter of Thomas and Leah Harper, in Greene County. In the 1900 census of Carrs township, Greene County: farmer Haywood Baker, 22; wife Orra, 20; daughter Lula, 6 months; and widowed mother-in-law Laurer Harper, 54. In the 1910 census of Farmville township, Pitt County: self-employed barber Haywood W. Baker, 30; wife Ora, 29; daughter Lular, 10; and adopted son Stiner, 9. On 13 November 1912, Haywood Baker, 33, of Nash County, married Mollie Vines, 26, of Nash County, in Nash County. In 1918, Haywood William Baker registered for the World War I draft in Wilson County. Per his registration card, he resided in Stantonsburg; was 24 February 1870; worked as a barber; and his nearest relative was Mollie Baker. In the 1930 census of Stantonsburg township, Wilson County: farmer Haywood W. Baker, 52; wife Mollie, 43; and children Charles, 17, Hildarene, 16, Jasper, 14, Harold, 13, Mary P., 11, Richard T., 7, and Carlton Baker, 5. In the 1940 census of Farmville township, Pitt County: farmer Haywood W. Baker, 62, and children Jasper, 22, Tensley James, 26, Richard Thomas, 16, and Carlton Baker, 14, and Mary Joyner, 20. All reported living in Greene County in 1935 except Tensley, who had lived in Goldsboro, Wayne County. In 1942, Richard Thomas Baker registered for the World War II draft in Wilson. Per his registration card, he was born 24 August 1923 in Stantonsburg; resided at 719 East Green Street, Wilson; his contact was Haywood Baker of the same address; and he worked at G.H.T.M. in Goldsboro, North Carolina. Haywood Baker died 17 August 1946 at Duke Hospital in Durham. Per his death certificate, he was born 14 February 1883 in Greene County; was married to Blanch Baker; resided at 719 East Green Street, Wilson; was a barber; and was buried in Marlboro cemetery, Farmville, Pitt County. On 18 September 1946, the Wilson Daily Times ran the first of a series of executor’s notices posted by John H. Baker, 524 East Nash Street, concerning the estate of Haywood William Baker. Last will and testament of Haywood W. Baker. The item Baker specially bequeathed his son John is now a prized collector’s item. 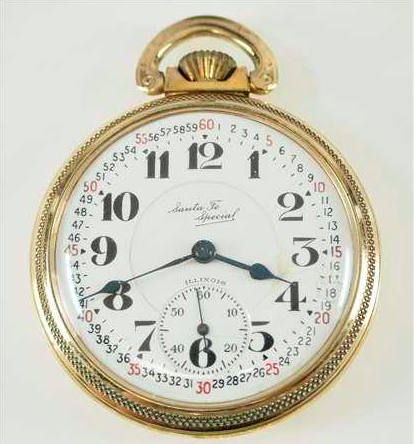 The Illinois Watch Company manufactured Santa Fe Special pocket watches from 1913 to 1935. Photo of Baker courtesy of Ancestry.com user cbaker2928; North Carolina Wills and Estates, 1665-1998 [database on-line], http://www.ancestry.com.